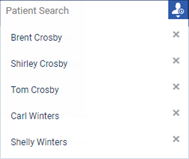 The names of the patients whose records you have viewed recently from a given computerdevice appear on a menu that is available from the Patient Search box. Position the pointer over (or tap) the Patient Search box's Recent button . Tip: You can click (or tap) the Remove button next to any patient name to remove that patient from the menu until the next time you select that patient.